The Forgotten Vale is an isolated region of Skyrim once inhabited by the Snow Elves to worship the God Auri-El. It is originally only accessible after traversing both Darkfall Cave and Darkfall Passage. 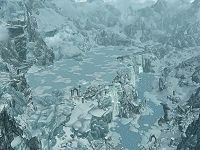 It is now inhabited by the brutish, corrupted Falmer, and the indigenous vale creatures: the vale sabre cat, the vale deer, frost trolls and frost giants. You will visit it during the course of the Dawnguard add-on's main questline, either as a Vampire Lord or as a member of the Dawnguard. The temple built by the Snow Elves in honor of Auri-El is found here. In front of the Inner Sanctum, there is a frozen lake with a word wall in the middle for the Drain Vitality dragon shout, which is guarded by the twin dragons Voslaarum and Naaslaarum. In the vale there are several other places that can only be reached from within the vale. 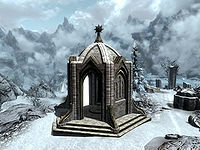 These can be reached, either directly, via the portals at the wayshrines or via the paragon platform; Forgotten Vale Cave, Darkfall Grotto, Sharpslope Cave, Glacial Crevice, Inner Sanctum, Auriel's Chapel (which is shown as Temple Balcony at the wayshrine portals, once the final wayshrine found there is raised at the end of the related quest), Forgotten Vale Forest, Forgotten Vale Overlook. You are also able to reach Darkfall Passage from the vale far more easily than through Darkfall Cave. Forgotten Vale Books Quest: Bring the Ancient Falmer Tome to Urag gro-Shub. Touching the Sky: Find and retrieve Auriel's Bow. You are transported by the portal within the Wayshrine of Illumination to a cave system with a path winding away and up to the surface. There are five gleamblossom plants found within the cave. You emerge high in the mountains overlooking the vale. There are many gleamblossom plants found throughout the first area of the vale and many torchbugs flying around at night. Off to the west, up an incline you will encounter a frost troll in its lair, which contains the bodies of a dead vale deer and vale sabre cat. 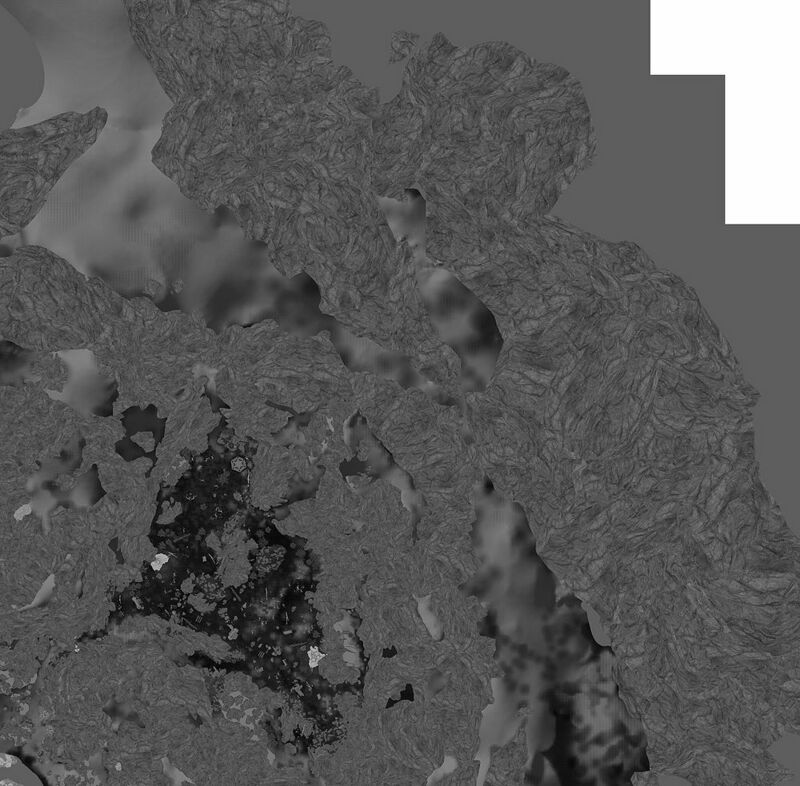 To the right is a silver ore vein. Two further silver ore vein can be found above the first, to the northwest, they can be reached by heading to the right of the troll's lair. A fourth vein can be found by heading north from the lair. It is on the ground to the east of a pointed stone arch. Heading north from where you exit the cave, you find another overhanging rock being used as a lair by a vale sabre cat. Just to the north is a silver ore vein and further north is a Falmer guarding the entrance to the Forgotten Vale Cave. Northwest from the entrance you will encounter Prelate Athring in front of the Wayshrine of Sight. Speaking with him will cause him to raise the wayshrine containing the second of the basins you need to draw water from. The wayshrine will also contain portals to each of the wayshrine you have visited and caused the prelates to raise. North of the shrine is a gold ore vein, from there head south, past the shrine to find another silver ore vein near several gleamblossom plants, to the right of a hill. West from that vein is another gold ore vein, found up against a rock face. Follow the rock wall south, until you reach the main path, before turning east and following it until you see another silver ore vein on your left. Once mined head back to the west, passing under a stone arch and as the path starts to climb, ahead are three frostbite spiders. Once they are dealt with backtrack slightly to just before a broken pillar on the left of the path, climb to the south to find another gold ore vein, the last in this part of the vale. Just past the three spiders, hanging from an overhanging rock by some webbing is a dessicated corpse that can be shot down with a bow or ranged magic. There are egg sacs on either side of you as you enter the pass and a giant frostbite spider will descend from above and attack. 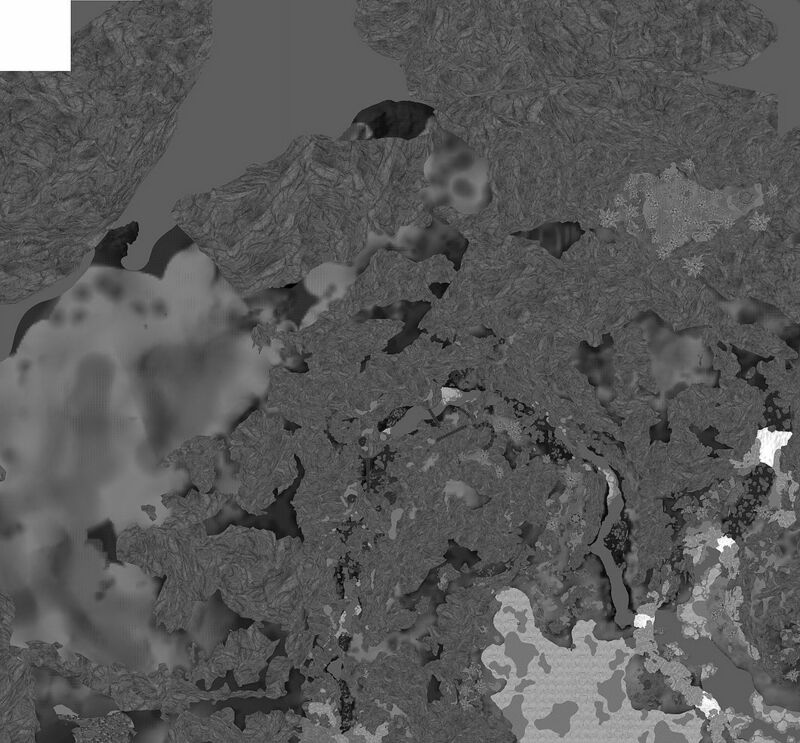 On your right is a gold ore vein. The pass descends into the next valley, where you can see a large waterfalls to the west and a wide river ahead. There are no more gleamblossom plants on this side of the pass. As you descend you will see what appears to be a skeleton on the right laying across a stone chest. On the ground beside the chest is a large coin purse and a book titled Unknown Book, Vol. I. As soon as you pick this book up a miscellaneous quest is added to bring this tome to Urag gro-Shub at the College in Winterhold. There is a snowberry bush by the riverbank and to the southeast, on the ground a quicksilver ore vein. Following the riverbank south you will soon reach Prelate Celegriath by the Wayshrine of Learning. Speaking with him will cause him to raise the wayshrine containing the third of the basins you need to draw water from. Dropping down to the riverbank and following it to the far end, where you'll see a waterfall disappearing underground. You can use this to enter Darkfall Grotto, however using the amethyst paragon at the paragon platform saves you entering the grotto twice or missing some quality treasure. To the right of this is a slope with a malachite ore vein part way up. Staying on that side of the river and following it back north, you will pass some broken stone pillars and a short distance before the next waterfall is an ice wraith guarding an apprentice-locked stone chest, with a skeleton, a satchel and a random enchanted war axe beside it. Just after the waterfall is a malachite ore vein. Continuing along the riverbank and just before reaching the bottom of the next waterfall there is a gap back under the ice containing an ice wraith guarding a novice-locked chest, with another skeleton and satchel beside it. The satchel contains two random potions of waterbreathing among its loot. 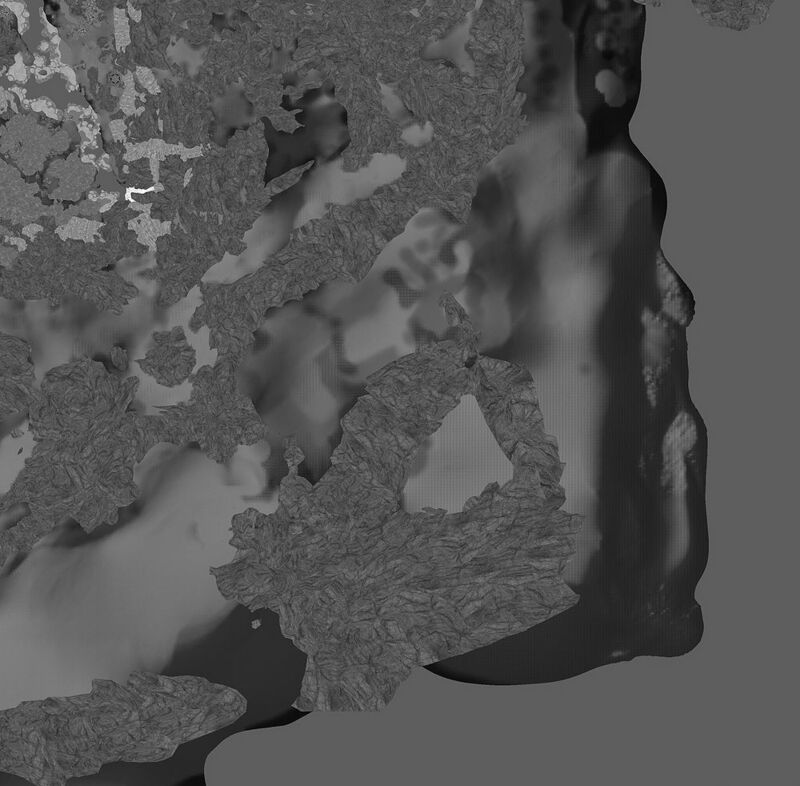 There is another malachite ore vein just after the waterfall and a third to the right of a tall snow-clogged tree, on the next land mass along. After the next waterfall there's a snowberry bush. Crossing back to the eastern riverbank and heading south a few paces to another snowberry bush, marks another malachite ore vein to the east. Continuing south for a hundred paces or so for one last malachite ore vein, before returning north. Continuing north along the bank is a frost giant which is carrying the amethyst paragon. There are two more snowberry bushes nearby. The river at this end is partially frozen enabling you to cross to the left-hand side of the waterfalls where you will find another malachite ore vein on the wall with a small piece of ice for you to stand on while mining. A few paces back to the south on the western riverbank is a path head north up a flights of stairs. Partway up the stairs, once you are level with the top of the waterfalls. Head northeast and on this side of wide rapids you will find a pair of broken pillars that are part of an arch with a pedestal on the right, which has a paragon socket in the top, these are all that remain of the Paragon Platform. With the corresponding paragon, this gives you access to several unique areas within the Forgotten Vale, which are inaccessible without the paragons as listed below. On the eastern bank, under an ice overhang is another frost giant, this one carrying the sapphire paragon. There is a malachite ore vein and snowberry bush to the right of it's lair. Back across to the path and stairs, this time following them to the top and across into the next valley. The path turns north following the riverbank. After a few hundred paces there's a bridge that crosses over to the western side. Then south from there you'll find the Wayshrine of Resolution, with Prelate Nirilor standing beside it. He will welcome you and after the same conversation as with previous prelates, he will raise the wayshrine, allowing you to draw water from the basin. Beside the building is a snowberry bush. From here you can either head southwest towards the frozen lake or return to the bridge and head north. Heading southwest leads to a stone arch with stairs leading up from the lake towards the wayshrine. At the bottom of those stairs is a skeleton that can be looted, with two random potions of resist fire beside it. Heading southwest from there and following the western edge of the lake will lead you to a total of three moonstone ore veins. The last of these is just past a small copse of trees with some broken masonry sticking out towards the lake. From this ore vein if you head due east towards the word wall, two named dragons; Voslaarum and Naaslaarum will both burst from beneath the ice covering the lake and simultaneously attack you. During the battle they may dive back through the ice several times, before smashing more holes in the ice when they emerge again. There are stairs that lead up to the word wall, which teaches a word for the Drain Vitality dragon shout. To the right of the word wall is an unlocked stone chest and beside that is a leveled potion of healing, two random potion of resist fire. There are also two chests submerged under the ice in the lake, there locations are noted on the map below. Any character that isn't an Argonian will require significant potions of waterbreathing or preferably an enchanted item or spell to recover the loot from these chests. A light staff or spell would also be desirable if you don't have night vision. Vampire's Sight is ideal as you can recast it as often as you like, even under water unlike spells. The first submerged chest is below the waterfalls on the south side of the lake. Following the edge of the lake, on the western side again and you will reach a large section of fallen masonry with a snow bank behind. An ice wraith will emerge from the snow and attack as you get close. Continue along the edge and you will pass a moonstone ore vein. There is also a second vein a short distance beyond the falls, nearly level with the bottom level of falls on the left. It is easily reached by walking up a slope a few paces further along. To recover the loot from the first submerged chest, enter the water directly beneath the falls, you can dive down to the chest found beside some sunken masonry. Leaving the water is easy, next head north-northeast from the falls until you reach a hole made by the dragons. Dive here, facing south and you should be able to see two broken off pillars very close to the hole. Between the pillars is the second chest lying atop a skeleton that you can't interact with. Head southeast from the hole, towards a stone arch that you can see from the hole, and nearby on the froze lake are two skeletons with an elven sword and two random potions of resist fire. Heading north, along the eastern side of the lake, you will pass another moonstone ore vein near where the rocks end. From there return to the bridge north of the Wayshrine of Resolution and cross back. Once back across, the path continues to follow the riverbank north, while descending. You'll eventually reach a small deserted Falmer settlement consisting of two Falmer tents, with a campfire between them. In the first of the tents there's a leg of goat on the ground and an easily missed vale deer hide in a large leather pouch. The second tent has a table formed from chitin with two random potions of healing, a pearl, a small pearl, a random filled soul gem and a fox pelt on top. Beside the table is another large leather pouch holding a Falmer war axe. By continuing along the river heading southwest, you will reach a group of five chaurus cocoons, two of which are occupied and with two orichalcum ore veins among them. A short distance further is the lower entrance to Sharpslope Cave. There is a second entrance found by following the other path that is closer to the rare shellbug it contains. There are four more orichalcum ore veins starting immediately to the left of the lower entrance and three occupied of five more chaurus cocoons. The last of the ore veins is in the corner on the opposite bank. From the small deserted Falmer camp, to the right of the tents and campfire is an unlocked gate across a path that zigzags up the side of a mountain. After a couple of switchbacks another bridge crosses the river. At the top of the path, before crossing the bridge, to the left is a Falmer tent guarded by a Falmer magic-user and containing a Falmer chest and another leather pouch to the right holding a gourd and pine thrush egg. The bridge is guarded by a Falmer. Any fighting is likely to alert several more Falmer to your presence. Across the bridge the path continues to follow the riverbank far below. As it reaches another bridge, this one made by the Falmer. On the left is a leather pouch holding a quiver of Falmer arrows and a Falmer sword. Across the bridge is a Falmer archer standing on a ledge overlooking the river below. The path heads west over a large stone arch, which is marked by two strange posts on the far side. The path continues to the west and directly in front of you is the upper entrance to Sharpslope Cave. The entrance is marked by a banner flying overhead. The path also continues past the entrance and descends around below the stone arch you've just crossed. Beside a tall stone spire you'll find three leather pouches on a flat topped rock, next to a gold ore vein. The leather pouches contain three rock warbler eggs, a pickaxe and four pieces of gold ore. The path heads to the south, leading to yet another Falmer-built bridge, which crosses to the east. On the far side is a Falmer tent containing a table holding two random potions of healing and a random potion of magicka. To the left is a leather pouch holding five chaurus eggs. As the path rises, on the back side of the spire is a Falmer chest that's out of sight until you're level with it. The path keeps rising, passing a gate, before you reach another Falmer. 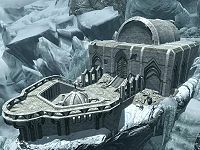 The area through the gate contains a frost giant along with several dead Falmer, a chaurus and chaurus hunter, all of which are leveled and appear to have been killed fighting the frost giant, which is carrying the emerald paragon. On the ground around the area are several Falmer weapons and shields, along with many bones showing this has been a battle that has been ongoing for some time. The path continues to circle the tall stone spire leading past a Falmer chest on a ledge, to a platform built by Falmer. It is possible to climb to the top of the spire, but apart from the view, there is only a snowberry bush. From the platform there is the tattered remnants of a Falmer bridge that originally headed north and another intact Falmer bridge heading southwest. This leads to another platform with a leather pouch on a ledge holding a bowl of frost salts and four samples of hawk feathers. Another stone arch crosses to the west and a Falmer tent guarded by a leveled Falmer. A second Falmer is patrolling the next bridge to the left. There are two leather pouches on your right as you once you cross the stone arch containing two racks of dog meat, a joint of raw horse meat and a cabbage. The tent is larger and more ornate than normal dwellings and contains a chest containing quality loot with a leather pouch to the right holding a joint of raw venison and a set of small antlers. There is a large rock behind the tent with a goat hide, a random poison, a set of large antlers, a Falmer bow and a leather pouch holding a piece of moonstone ore and a piece of chaurus chitin. To the left of the tent is another leather pouch holding a troll skull. The next bridge heads south to an area with two more tents built facing each other, on a platform that is on a slant. The tent on the right contains a vale deer hide, a normal deer pelt, two haunches of raw venison and a Falmer war axe on a wooden chopping block. The tent on the left contains two leather pouches, one holds two racks of dog meat and the other holds a sample of hawk feathers, two pearls and three small pearls. Behind and above the tent on the left are a couple of rocks stacked on top of each other with an altar or statue of sorts made from a goat hide that can't be interacted with, laid flat on a leather pouch with two garnets, a ruby and troll skull arranged on top. There are also typical Falmer posts on either side. The path heads southwest to the next ledge and across another bridge to a larger area, with a haunch of raw venison in a leather pouch on your right as you leave the bridge. In front of you is a large rock with is a Falmer sword and skull on top and a leather pouch to the right holding a piece of chaurus chitin. There is a Falmer tent around to the left and up a ramp, with deer skulls and antlers stuck to posts flanking the entrance containing a Falmer chest with leather pouches holding six loose Falmer arrows and a random empty soul gem on either side. Under the tent is a gated storage area containing two haunches of raw venison, three cabbages and a gourd. A ramp leads down to the south and another ledge guarded by a leveled Falmer. At the back of this area are two more pouches holding a piece of chaurus chitin, two chaurus eggs, and a goat hide. From this ledge a stone bridge heads southwest and a Falmer-built bridge heads west. The latter of these leads down to a Falmer tent, with a mammoth skull and broken off tusks attached above the entrance and containing a table holding Unknown Book, Vol. III, two random potions of healing and three pearls. To the left is a pouch holding a vale deer hide. Heading across the stone bridge to the southwest and then back across on another stone bridge heading southeast and to an open area with an earthen ramp descending to the river heading north. At the bottom, on the opposite bank are three chaurus cocoons, but only one that's occupied. There are also two final orichalcum ore veins. Returning back up to the open area, to the east is a path up to a pass between mountain peaks, climbing here leads to three moonstone ore veins; two on the ground and one on the side of a rock to the south. Again return to the open area and head south to where some Falmer fencing is stretched across in front of the river's headwater, protecting two leveled Falmer that are guarding the entrance to Glacial Crevice. Once you have passed through Glacial Crevice, you will emerge again outside in an isolated area within the Forgotten Vale. There are two paths, the first in front of you leads under a walkway that links two raised Falmer tents and continues on towards more Falmer settlements. While the second, on your immediate left, heads north and after a few paces there is a string of bone chimes stretched across the path. Beyond this two Falmer patrol a pair of gates that block an area containing a frost giant. There is a Falmer chest to the right of the gates and a dead Falmer lying on a large rock just beyond them. Beyond the gate there are several more dead Falmer, the occasional weapon and all manner of bones scattered all around the area including mammoth skulls and rib cages. To the northwest is the frost giant's lair, which is under an overhanging rock. There are the bodies of two chaurus, a chaurus hunter, and two more Falmer in the lair, along with two Falmer bows and a Falmer sword. The frost giant carries the diamond paragon among the loot it carries, which enables you to use the paragon platform to transport you to a unique area within the Glacial Crevice. There is a quicksilver ore vein at either end of the lair and two to the south, one near the top of a rise and the other another hundred paces or so. The two raised tent by the exit from the Glacial Crevice have two curved ramps leading up to them. Inside the first tent, which is on the left, is a central campfire with a Falmer sword and rack of dog meat either side of it and a second Falmer sword, a vale deer hides, a deer pelt, a piece of chaurus chitin, a haunch of raw venison and a gourd either on benches or in a leather pouch against the wall. A walkway links across to a second tent on the right, which contains a Falmer chest and a leather pouch holding a pine thrush egg, a rock warbler egg and two pieces of honeycomb. Under the second tent is a string on bone chimes. Following the path east, you pass another tent at ground level on the left containing two legs of goat, three gourds and a set of large antlers among straw scattered on the floor. The next section of the path is trapped with a tripwire at either end, that each trigger separate claw traps. While above them is a lookout point with a Falmer on guard. Once past the second tripwire there are two ramps. The ramp on the left leads back and up to the lookout point and a raised tent to the right, which has a central campfire and a troll skull on a bench. A second Falmer, who is a magic user is standing in the middle of the ground level path, beyond the start of the second ramp. To the right of this Falmer is a leather pouch behind a section of fencing. It contains a piece of silver ore and two pieces of quicksilver ore, with another piece of quicksilver ore on the ground beside it. Any fighting with either of them is likely to alert several more Falmer in the settlements beyond. The second ramp has another tent built under it and containing a leather pouch holding a rack of dog meat and a leg of goat. The ramp leads forward and up, passing a smoky campfire to a series of walkways that crisscross the settlement and link several tents on differing levels. Take care as there is another Falmer patrolling a walkway further ahead and a Falmer magic-user in the first tent on the left. Before reaching the junction for it, you will pass the top of a tent on a lower level. Inside the raised tent on the left are three samples of hawk feathers, a hawk beak, a glowing mushroom, two bowls of powdered mammoth tusk, a bowl of bone meal, a set of small antlers and three loose chaurus eggs, all found on a bench or in two leather pouches. There is also an alchemy lab built into table with two random potion of either healing, magicka or stamina beside it. The main walkway continues, passing a raised platform with an open wooden box filled with water containing three living clams that can be harvested. Next to this the walkway passes between the side of a tent and a tall rock, with strings on bone chimes hanging down. The main walkway continues past another junction on the left, all the way to a rock wall at the back before turning left and continuing on and through a gap between two walls to another area. The junction on the left passes another tent on this level on your right, and opposite is a curved ramp leading up and around the tall rock to the entrance to the tent beside the clams. The tent on this level contains a table holding a fox pelt, a random filled soul gem, two chaurus eggs and two random potions of either healing, magicka or stamina (see bugs). The tent at the top contains a Falmer chest and two mammoth tusks in a leather pouch. After the walkway continues past the previous tent it takes a couple of turns and passes more bone chimes, before passing the entrance to the empty tent you first passed the top of and then past another that contains an ice wolf pelt on the floor, two vale sabre cat hides and two pieces of quicksilver ore on top of a straw bale, and an open crate holding a pickaxe, two more pieces of quicksilver ore, two amethysts and an emerald. The walkway then descends to the ground. There are two quicksilver ore veins on the ground beneath this settlement, with three loose pieces of quicksilver ore and two pickaxes next to the second of them. Passing between the rock walls leads to more raised tents with the walkway continuing between them. The tent on the right contains a gourd and leg of goat on the floor, while the one on the left contains a table holding two chaurus eggs, two pieces of chaurus chitin and a honed Falmer sword. Around the corner there are two Falmer patrolling up and down a walkway. There are three more tents on the left. The first is below you, after a switchback in the path. Next to it is another containing two more legs of goat and two rock warbler eggs in a leather pouch. The third off of a junction and is on it's side, with an occupied beehive, containing a bee and a piece of honeycomb, which you can also harvest part of the beehive husk, hanging from the ceiling. The walkway continues past these other tents and leads up to a tent that is far large and more ornate. It contains a Falmer chest, bench, table and leather pouch, holding a sample of hawk feathers, a set of small antlers, a birds nest containing a rock warbler egg, two random potions of healing, magicka or stamina, a random poison, the Unknown Book, Vol. IV, a beehive husk and piece of honeycomb. Returning back along the walkway and taking the switchback passes the other tent, which contains a bench with a sprig of snowberries, a pearl and a garnet. As you descend further you'll see three chaurus cocoons, two of which are occupied. The walkway goes around a fire before reaching the ground facing away from the cocoons. Under the last tent is a storage area containing four pieces of chaurus chitin. The path heads east from here, before reaching a double gate with a campfire to the left. Through the gate the path passes into a huge tunnel and starts to rise heading south. There is a lookout point on the left part way up, several glowing mushrooms found groing from the walls along this tunnel and a quicksilver ore vein behind it on the left. At the back of the area is an empty Falmer tent, which the path passes as it turns west and continues to rise even more steeply. The tunnel has large rocks on alternate sides, that stop you seeing far ahead. The path pass on either side or between two Falmer-built ledges and/or the large rocks. 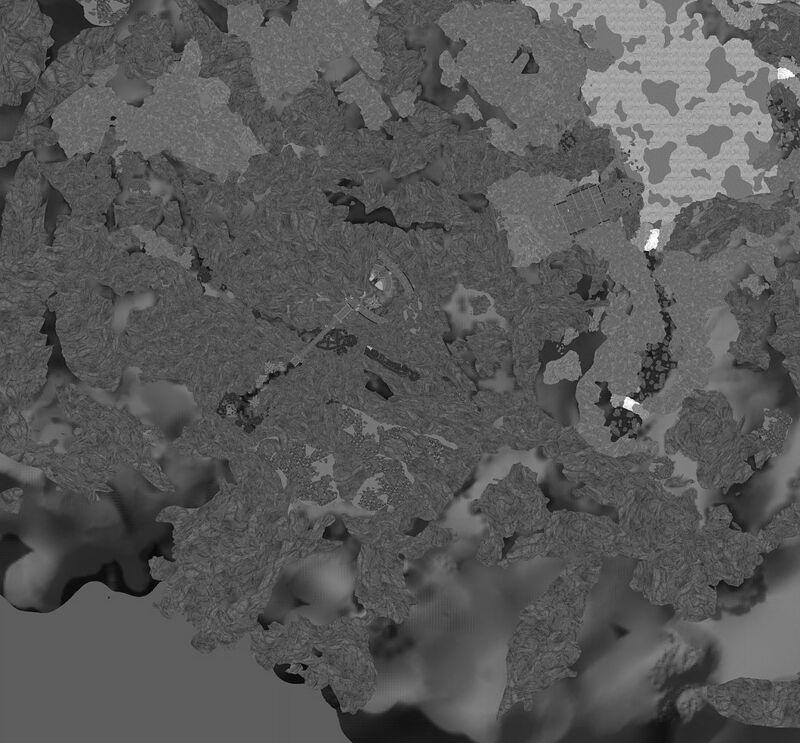 There is then another quicksilver ore vein on the left. Further up the rise, on the left is a second Falmer-built ledge with an empty Falmer hive on the wall behind it. The path then passes through a narrow gap with a tripwire across the front that triggers a large rockfall from further up on a raised section, facing the gap, behind an occupied hive concealing a leveled chaurus hunter. There is another quicksilver ore vein on the left as you pass through the gap. At the top is one final quicksilver ore vein on the left before you emerge out of the large tunnel heading northwest. There are more Falmer tents on various levels and in front of you is Prelate Edhelbor, who is standing in front of the Wayshrine of Radience. After speaking with him, he will raise the wayshrine, which enables you to draw the water from the basin. This should be the fifth and final wayshrine. Inside are portals to all the wayshrines you've found and caused to be raised. There is a ramp leading up to a Falmer tent to the left of the wayshrine. Inside the tent are three leather pouches holding two bowls of troll fat, a bowl of powdered mammoth tusk, a leg of goat, a gourd, and a mammoth tusk. The walkway continues up past another tent containing a goat hide, a piece of honeycomb, a troll skull and a normal deer hide. The third tent contains two quivers of Falmer arrows and two pieces of chaurus chitin, with one of the quivers on the floor beside the pouches, which hold the remaining items. The walkway now crosses to the right-hand side of the wayshrine passing the empty lower floor of a two-story tent, with a ramp spiraling up to the upper floor. The upper floor has open sides for use as a lookout points. Inside are three leather pouches holding a haunch of raw horse meat, a leek, and a haunch of raw venison. A walkway follow along a stone wall before spiraling up to yet another tent. This one contains a table with three random potions of healing and three random potions of magicka. Either side of the table are leather pouches holding two orange dartwings, one blue dartwing, a luna moth wing, two blue butterfly wings, a sample of slaughterfish scales, four pearls, and two small pearls. The path heads northeast from here towards a large stone arch and stone bridge that crosses to the Inner Sanctum. Before climbing the stairs and crossing, there is another quicksilver ore vein to the left, on the west rock wall. Under the bridge, to the right are three loose elven arrows. Far below this point is a ledge that can only be reached by using careful rock climbing or the become ethereal dragon shout and dropping from under the bridge. On the ledge is a gold ore vein, with a skeleton beside it that can't be looted, along with a pickaxe, a gold ruby necklace, a Falmer sword, a bowl of powdered mammoth tusk, two pieces of gold ore, a diamond, two flawless diamonds and a bird nest containing a rock warbler egg. From here, you can reach several more ledges with harvestable bird nests. Once finished, you can either climb down or use become ethereal again and drop to the first settlement after entering the isolated section of the Forgotten Vale. Cross the bridge. Before you is a flight of stairs leading to the chantry courtyard, but before heading up there, turn to your left, where a rock outcropping beyond a lone arch holds several gems, a necklace and an elven greatsword. Return to the bridge and head up the stairs into a courtyard dominated by a statue of Auri-El. The huge double doors beyond the two winged stairs are locked until you complete the pilgrimage ritual. To do so, empty your initiate's ewers into the basin at the top of the stairs behind Auri-El's statue, filling it with the water collected from the five wayshrines. The doors will unlock and grant you access to the Inner Sanctum. Paragon Platform, also referred to as Paragon Portal, will allow you to open portals to a few otherwise inaccessible locations in Forgotten Vale. To find the Paragon Platform, go to the Wayshrine of Learning and turn northwest. Follow your way along the water until you see a path rising up a series of flights of stairs on the shore opposite the Frost Giant who carries the amethyst paragon. Follow these stairs about midway up (not to the top), until you are level with the top of the waterfalls on your right. At that point, turn northeast and keep going. On the near shore to the left is the Paragon Platform and on the opposite shore is a frost giant which is carrying the sapphire paragon. The portal uses the five different paragons to open a portal to unique areas within Forgotten Vale. The paragons are all carried by frost giants, as noted on the map below. The Amethyst Paragon opens a portal on an inaccessible ledge within Darkfall Grotto. The Diamond Paragon opens a portal on an inaccessible ledge within Glacial Crevice. The Emerald Paragon opens a portal to Forgotten Vale Overlook. The Ruby Paragon opens a portal to Forgotten Vale Forest. The Sapphire Paragon opens a portal in an inaccessible room within Inner Sanctum. Auriel's Shield can be obtained in Forgotten Vale Forest. Items in some tents may have fallen through the table and/or the bottom of the tent itself, making recovering them difficult. Using an area effect spell both inside and outside the tent gives the most likely chance of recovery. The yellow pogs ( ) mark locations, the red pogs ( ) mark items and Frost Giants, and the green pogs ( ) mark miscellaneous points of interest, such as ore veins and chests. Mouse over the pogs to read additional information. This page was last modified on 15 April 2019, at 23:13.